Last week I showed a couple of continuous-time Fourier transform pairs (for a cosine and a rectangular pulse). Today I want to follow up by discussing one of the ways in which reality confounds our expectations and causes confusion. Specifically, when we're talking about real signals and systems, we never truly have an infinitely long signal. The dots at the left and right of the cosine plot are meant to remind you that the cosine signal is defined for all t.
But what if we modify the cosine signal so that we have only a finite number of periods? Let's start with a single period, for example. 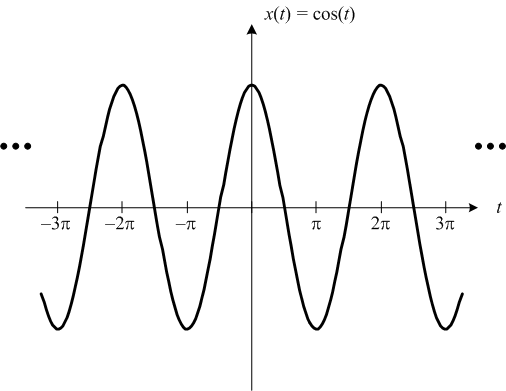 In signal processing jargon you'll see this kind of signal referred to as a windowed cosine with a rectangular window. 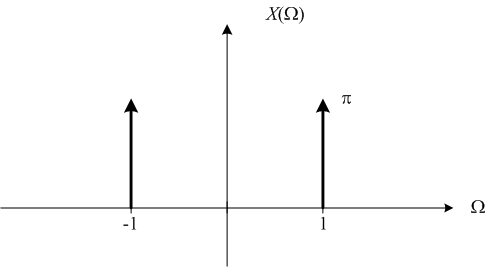 That is, the signal is an infinite-extent cosine multiplied by a finite-extent rectangular pulse. where N is the number of periods. 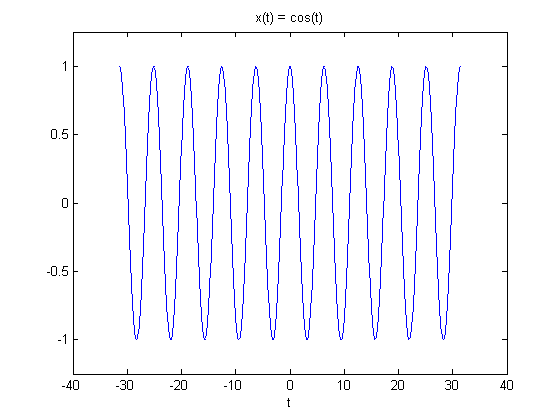 Well, that doesn't look very much like the continuous-time Fourier transform for the ideal cosine! If you run this code yourself, try zooming in to look closely at those peaks. You'll see they aren't even located precisely at 1.0 rad/s. That's closer, but there's still a lot of funny stuff going on. 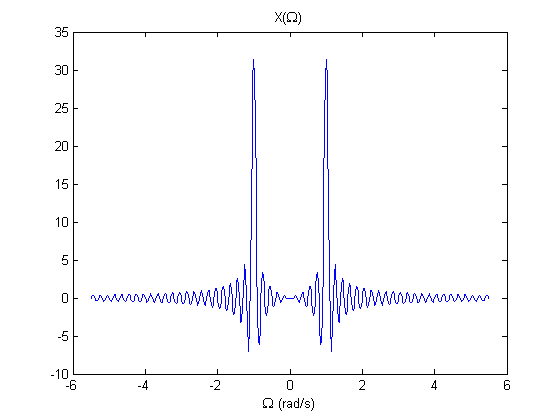 The more periods we use, the closer the Fourier transform gets to the ideal case, but for any finite number of periods we're going to get this decaying ripple effect. 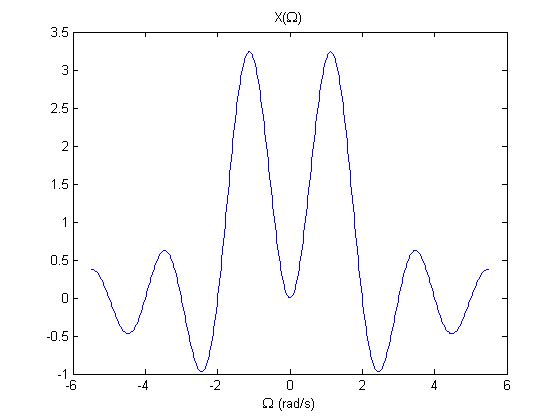 Later, when we start constructing synthetic spatial sinusoid images (like in this post), and what we see in the frequency domain looks "messy," this is one of the big reasons. All our images have finite extent! We'll be coming back to this idea in future posts. Have you heard the term bandlimited? It refers to a signal that has no frequency energy above a certain cut-off frequency. Ponder this notion: No finite-extent signal is bandlimited. 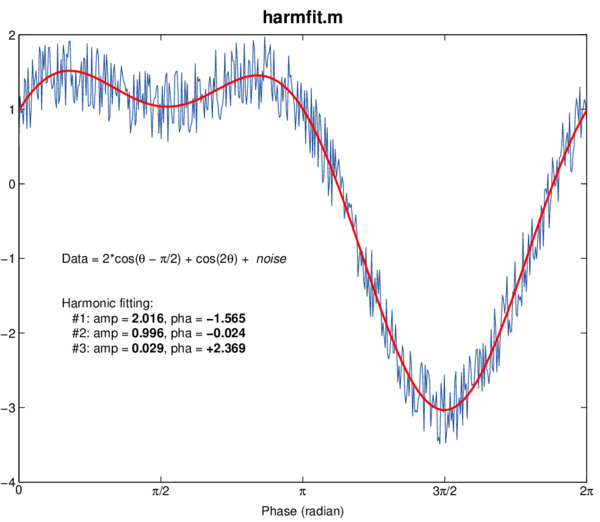 That is, any signal that is nonzero over only a finite portion of the time domain has nonzero frequency energy across the entire frequency domain. I think that next time I'll be ready to start talking about the discrete-time Fourier transform, or DTFT. 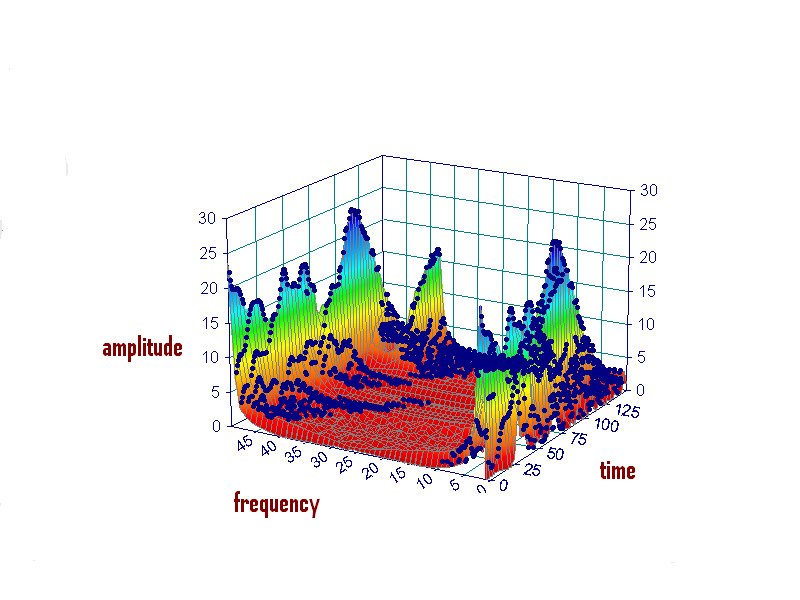 Conceptually we are traveling methodically toward the discrete Fourier transform, or DFT, which is what the MATLAB function fft computes. Along the way we'll figure out how all three forms (continuous-time Fourier transform, discrete-time Fourier transform, and discrete Fourier transform) relate to each other. Hello Steve. Thanks for this post. Regarding the DTFT calculation, you could do it using the Symbolic features of MATLAB, couldn't you? Thanks. Drazick—I'm not sure what you mean by DTFT in your comment, since this post was about the continuous-time Fourier transform. 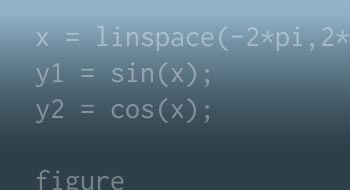 Deriving the continuous-time Fourier transform of a windowed cosine involves the convolution of a sinc function with a pair of impulses, which is pretty trivial to write down. The only thing that required special care was getting the scale factors all correct, and I would have spent just as much time on that part of it if I were using Symbolic Toolbox. Sorry, my mistake. Just wanted to take advantage of your posts to see how can I use the Symoblic capabilities of Matlab. It should have worked for CFT as well :-). John—I don't have a recommendation other than what's in Digital Image Processing Using MATLAB (see chapter 4). I haven't kept up with signal processing books that much since my academic days. Perhaps some other readers will chime in here. Never mind my previous comment. I worked through it using the convolution theorem and sifting and got the same result as you. 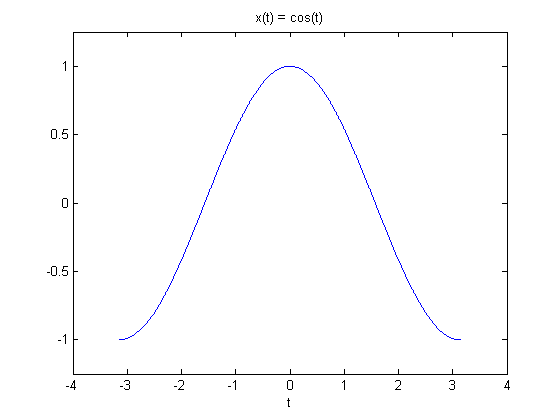 Simerdeep—While it's theoretically true that a time-limited signal cannot be bandlimited, it can certainly be approximately bandlimited, and that approximation can be good enough for practical system design purposes.